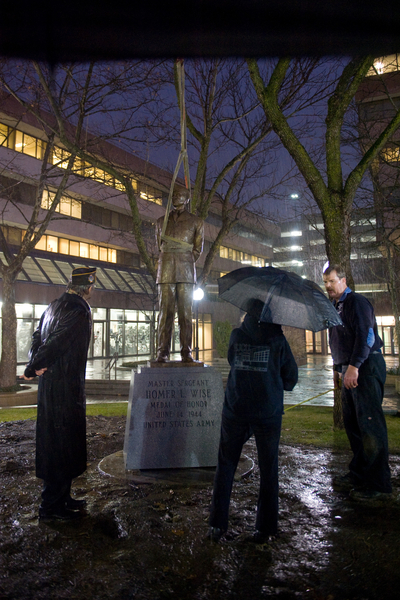 STAMFORD — In the darkness and pouring rain, city workers lowered a bronze statue of Homer Lee Wise — the city’s only Medal of Honor recipient — onto its base at Veterans Park on Tuesday night. James Vlasto, Wise’s longtime friend who had been waiting for the moment for years, quickly took off his tweed newsboy cap and put on his garrison cap. “When they put the statue up, I want to salute it, and I can’t salute it without my hat on,” Vlasto said. And so, in a touching moment between friends, that’s what he did. Vlasto jumped onto the platform mound, stood near the statue and gave him a salute. Though placing the statue was a battle, Wise faced much tougher ones during his time in World War II, particularly in the Battle of Magliano in Italy in June 1944. His actions there are what gained him the nation’s highest military award. Now Wise will stand looking out on Atlantic Street, a short distance from St. John’s Church, where he married his wife, Madolyn DiSesa, and across from Old Town Hall, where he worked for 12 years as an Army recruiter. Rinaldi said watching the 6 1/2-foot statue being placed was a great moment — one that has taken about five years to happen. As his regiment, the 142nd in the 36th Infantry Division, was being pummeled by German troops in June 1944, Wise ran through gunfire to carry a wounded soldier to safety. In an effort to protect his men, Wise single-handedly held off German gunners with a grenade launcher. When the gunners fled, Wise followed, firing at them with a submachine gun. Other enemy troops began to fire from a distant range, so Wise walked through flying bullets, picking them off with an automatic rifle. An American tank emerged to help and Wise leapt on top and unjammed a machine gun mounted on the turret. He then fired 750 rounds, clearing the way for his regiment to proceed up a hill. For acts of bravery in other battles, Wise also received the Silver Star, the Bronze Star, the Purple Heart and other medals. Janice Mauro, the sculptor, said she was asked to make a facsimile of Wise, so she came up with three 10-inch wax figures. The Homer L. Wise Memorial Committee chose one of him standing. From there, she went to a 30-inch clay model and then the final version. The statue was cast at the New York Foundry in Brooklyn through the lost wax process. Vlasto wanted him at a virile age, when he fought in the war, Mauro said. She then found a World War II uniform and had her husband pose with it on. “I felt this was in honor of the action he took, but I found that he was just a guy doing these things,” she said. Mauro turned his head like Michelangelo’s David. She said just like David fought Goliath, Wise had to fight and save his platoon. She said Wise — who was 6 feet tall with dark hair and blue eyes — was a very good-looking man. When workers arrived in the park with the statue, Vlasto watched them take it off the truck, face-down on a handcart. He said Wise received the Medal of Honor at 27 years old. “And that’s exactly how he looked, too,” he said. Vlasto said receiving the Medal of Honor is a distinction because of the 16 million who served during World War II, only 2 million saw combat and just 464 received the medal. Nearly half received it posthumously. Wise returned to Stamford and got married in February 1945. Vlasto said he met Wise in 1956 at Jackson’s, his uncle’s bar in the Ridgeway Shopping Center. His aunt introduced them and they became friends. 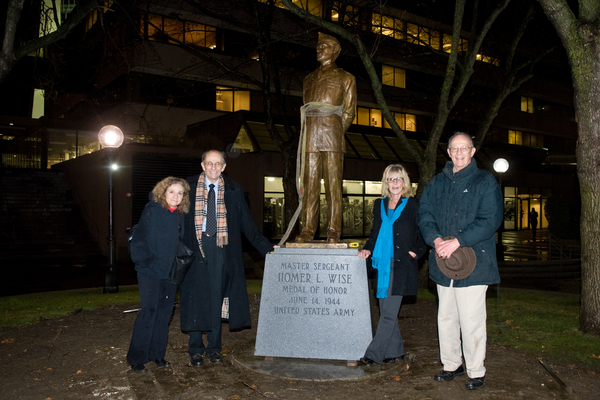 Left to right Sculptor Janice Mauro, of Redding , CT; James S. Vlasto, founder and executive director of Homer L. Wise Memorial Committee; Jean Rinaldi of Stamford, CT, niece of Homer Wise and George S. Vlasto, Vice President of the Homer Wise Memorial Committee and long time friend of Homer Wise. ﻿﻿﻿﻿﻿﻿﻿﻿﻿﻿﻿﻿﻿Wise didn’t like the attention he received and had a hard time adjusting to life after the war, Vlasto said. After two years of civilian life, he went back into the Army and was stationed at the recruiting office in Stamford. “He worked for 12 years in that building over there — Old Town Hall,” he said. Wise, who lived in Springdale, took some assignments in Europe and then left the military in 1966. Seven years later, he collapsed and died on a Stamford street.